My kids clothes do not stay clean for very long, once they eat a snack it's all over! And I'm convinced that my son will never believe that his shirt is not a napkin anytime. Their clothes need more than a simple wash, they need to be stain treated. And I've tried to stain treat their clothes by treating each individual stain, but that is a giant pain! I just don't want to spend my time examining clothes for spots to treat. I think cherries were the worst stain culprits this summer. My kids and I love cherries, we don't know what's wrong with my husband who doesn't like them. And I finally broke down and bought a cherry pitter which makes serving cherries to small children much easier. Did you know when something is easier, I do it more often? We ate several pounds of cherries this summer. Of course this is what happens when little kids eat cherries. Sometimes I think it would be very smart to only allow my children to wear dark colored clothes. But since it's not very practical, I haven't gone there yet. Earlier this summer my daughter's favorite dress was ruined when it was washed and dried without any stain remover since the detergent didn't get the cherry juice out. She was so upset and so was I since she had only worn it twice! I threw this dress in the wash with some OxiClean Versatile Stain Remover and hoped for the best. The rest of my kids clothes had some stains, but nothing as bad as this dress! I was fully planning on looking at the dress before it went into the wash so I could directly treat the stain with the OxiClean Versatile Stain Remover if it didn't come out. I was very impressed when it came right out! No need for further treatment and in the dryer it went. 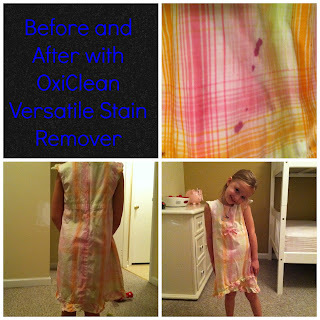 One lesson that I've learned when it comes to kid's clothes, always use a stain remover! After the favorite dress debacle, I think the other laundry helper in the house has learned this lesson as well. OxiClean Versatile Stain Remover is a chlorine free and color safe, oxygen based stain fighter designed for maximum strength stain removal in your laundry and around your home. OxiClean Versatile Stain Remover has the most stain fighting oxygen power of any OxiClean product. What do you use to get stains out of your laundry? 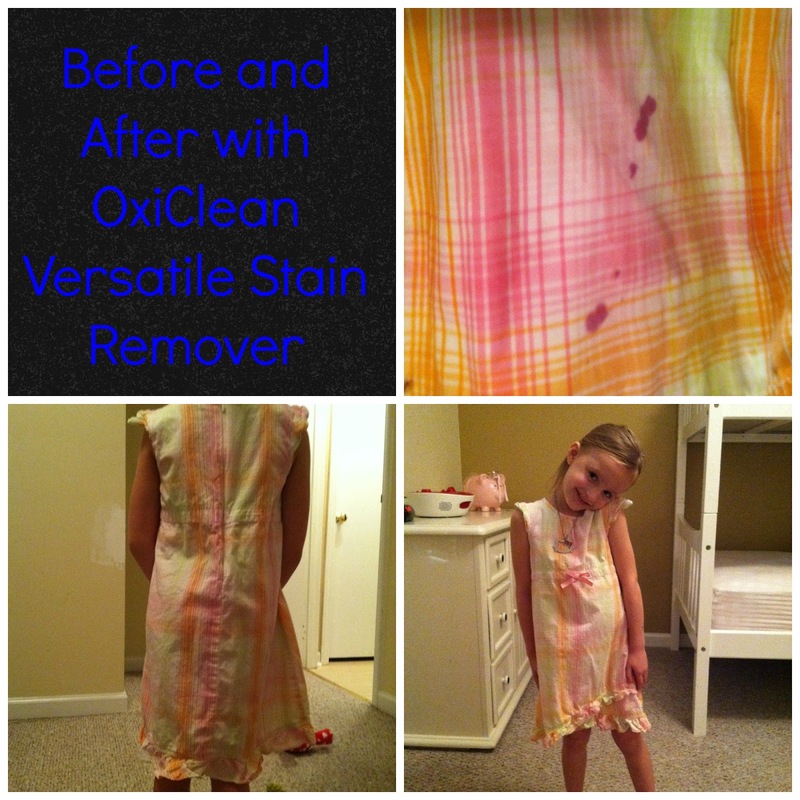 Have you ever tried OxiClean Versatile Stain Remover?